14" long (35 cm) Supersoft tagalongs with satin paws and footpads. Color-coordinated piping and embroidered eyes. every parent knows, it's smart to have a spare comfort item. go for the Twofers - -Purchase two of the same Lil Snugglers, enter promotion code 2FER in the shopping cart, and get 10 off! (no additional shipping cost, price will adjust automatically when you enter the code). 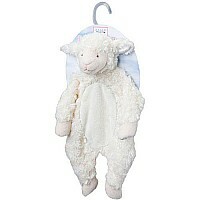 NEW Sshlumpies are supersoft blankies that can also be put together in matching sets with Rattles, Squeakers and Snugglers. All meet Toy Safety Standards for Birth and up.